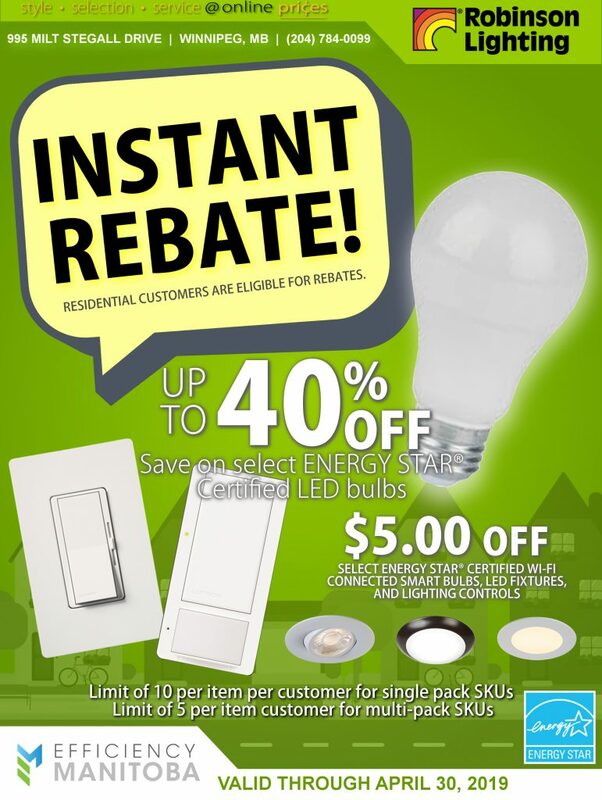 Robinson Lighting Centre will be taking part in the Efficiency Manitoba SAVE NOW Rebate from April 4 until April 30, 2019. Save up to 40% off on select ENERGY STAR® Certified LED bulbs, ENERGY STAR® Certified LED fixtures, and lighting controls. There is a limit of 10 items per customer for single-pack products and a limit of 5 items per customer for multi-pack products. If you would like to learn more about the Efficiency Manitoba rebates or would like to know what items are available for rebate, contact or visit our Winnipeg Showroom. Our Lighting Specialist are always happy to help!